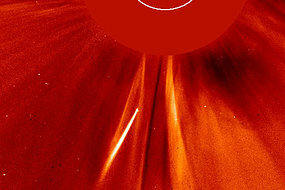 An exceptionally bright comet headed toward the sun and disintegrated on October 2, 2011. Moments later a large coronal mass ejection (CME) blew off the other side of the sun, making for this captivating movie from the Solar Heliospheric Observatory (SOHO). While it looks to the casual observer that the comet triggered the ejection, the apparent relationship between an incoming comet and a CME is only a coincidence. This comet known as a Kreutz sungrazer. The Kreutz Sungrazers are a family of sungrazing comets, characterized by orbits taking them extremely close to the Sun at perihelion. When a comet comes this close to the sun, it is almost always destroyed .